* Disclaimer: We offer a satirical parody of Jack Sparrow and other characters. 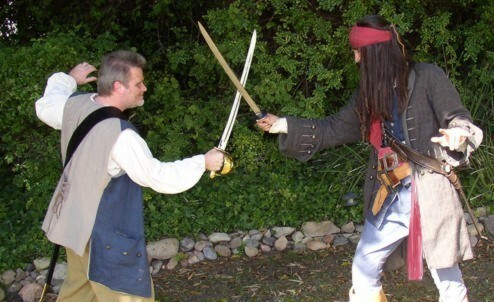 Pirates for Parties in no way imply to claim any rights to the character of Jack Sparrow or the name Jack Sparrow or the name Pirates of the Caribbean. The characters and names including, but not limited to Captain Jack Sparrow, as well as the title "Pirates of the Caribbean: The Curse of the Black Pearl" are TM and © (or copyright) by Walt Disney, Jerry Bruckheimer and its related entities. All rights reserved. Any reproduction, duplication or distribution of trademarked or copyrighted materials in any form is prohibited. This website and its contents are in no way authorized or endorsed by Walt Disney Corp, Jerry Bruckheimer Productions, Johnny Depp, or any of their subsidiaries. Parrots4Parties is not affiliated in any way, nor do they by fact or inference imply to hold any rights or authorization, rights of association or sponsorship or endorsement of the use of any copyrights or trademarks as held by any individuals, or companies mentioned or pictured in association with any offer, including, but not limited to Walt Disney, Jerry Bruckheimer and its related entities. Any reproduction, duplication or distribution of these materials in any form is prohibited. Rancho Mirage, Indian Wells, Thousand Palms, Moreno Valley, Claremont, Montclair, Riverside, Ontario, Upland, Cucamonga, Redlands, Corona, Las Vegas, San Francisco, SF -CA . We also provide service in the states of New York, Illinois, Pennsylvania, New Jersey, Conneticutt, Rhode Island, Washington D.C. Maryland, Virginia, Massachusetts, Florida. Texas, Ohio, Nevada, Colorado, Indiana, Wisconsin, Kentucky, We will travel anywhere in the USA. Only Disney can offer a Captain Jack Sparrow character. 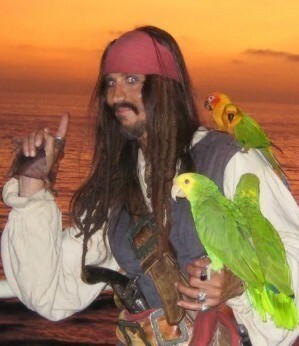 No other company has the right to offer the services of a Jack Sparrow inpersonator. 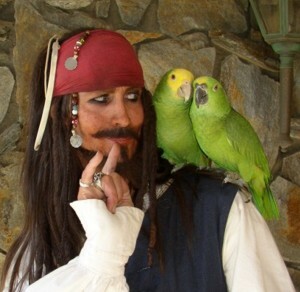 Parrot Jack, seen here is not Jack Sparrow, he is a satirical parody of that character. Pirates for Parties does not offer Disney trademarked characters nor do we intend to imply that any trademarked character is available through any offer presented on this web site. We provide pirate characters which include Captain Parrot Jack, a satirical parody of that other famous Caribbean pirate captain in the Disney movies. Parrot Jack seen at right and in the other pictures on this web site is available with or without parrots in Southern California and also without parrots in other states. Above Parrot Jack sword fighting another pirate Parrot Jack is in Chicago Pennsylvania, Virginia, We also serve New York - Ohio, and many other states.